The Aggravation board game is a textbook classic. This game is fun for anyone of any age. This game is truly one of the only games that I can say you will not tire of, because the game is constantly changing. It is great for parties as well as just a family fun night. Played on a board shaped like a star, you can teach young ones counting and colors, as well as cause and effect. For older kids or adults, this game can be a great stress reliever. It can become one of your “Family Fun Night” favorites in no time. Up to six players take turns rolling the die and moving their colored marbles around the star-shaped game board. 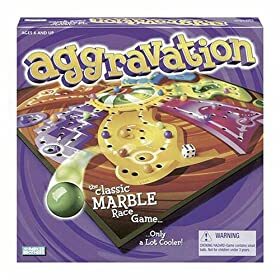 Each player moves their marbles strategically to avoid being sent back to base (the first “Aggravation”) or to send others back. The game is won by moving all four colored marbles to home. This is done by pulling your marbles one at a time into place. This sounds simple enough, but you must roll exactly the right amount to correctly move your marbles into place. This is the the last “Aggravation”! The game has very easy to follow rules. So rules cannot be misconstrued. However, people have been known to add “twists” to the game for adults to make it more challenging. This game is a game of chance and skill in equal parts, which makes for a great good-hearted fun. The only thing I would take in to account is that game play can become an extended affair. I would definitely take this into consideration when playing with young ones. Also, hence the name, it can be aggravating and should be enjoyed good heartedly. This game is a awesome game for anyone of any age. It can be played at just about any occasion. The Aggravation board game is a classic game of wit, luck and laughter. It is definitely highly recommended as a addition to anyone’s collection. This game can be altered to add more twists and turns to provide even more challenge. This keeps the game fresh and new, which means that you will never get tired of it! I used to play this with my parents in the 70’s and it’s still a great game.